We are pleased to introduce a new ebook from Christopher O'Donnell concentrating on how to make the best use of that time of day when the sun is in the lowest part of the sky - at sunrise and sunset. The Golden Hours: A Guide to Photographing the Light of Sunrises and Sunsets is an eBook written to help guide photographers through the unique challenges that this light presents. Many photographers will often note that their sunrise and sunset images rarely represent the scene they observed. By detailing the steps I go through to create my images – both in the field and in the digital darkroom – I explain why this is so, and more importantly, how to transcend the disparity between your view and your results, allowing you to create realistic images of this beautiful light. The “golden hours” refer to the window of time when the sun is at its lowest point in the sky, just before it sets or right after it rises. As the sun nears the horizon, the light begins to dramatically transform the landscape before you. The atmosphere becomes thick and golden, shadows are lengthened, and highlights are brightened. Soon, your scene develops texture, depth, and becomes a stunning show of light. It’s a highly-coveted time to photograph the landscape, but is also challenging to many photographers as the uniqueness of this light requires some specialized knowledge to capture. In this eBook, you will find detailed solutions to the challenges this light presents – from compositions to exposure difficulties – so you can begin to photograph the golden hours with confidence and accuracy. With this new knowledge, you can focus on enjoying your photography while expanding your creative horizons. Choosing a Location: How to find prime locations for the golden hours, what tools I use to help me scout, and special considerations to take to help you select the best vantage points. Finding Interest: How to compose your image, find balance, and unlock your creative potential when framing your scene. Judging Your Light: This section explains the unique exposure challenges that the golden hours present, and multiple ways to overcome them – allowing you to choose one that compliments your workflow. Tripods and Focusing: Special considerations to take when focusing your image, and the importance of image stabilization for the golden hours. Creativity with Aperture: The golden hour light has a unique ability to transform the landscape, and your depth of field can greatly affect how this light appears. This section shows the creative power your aperture can have during the golden hours. 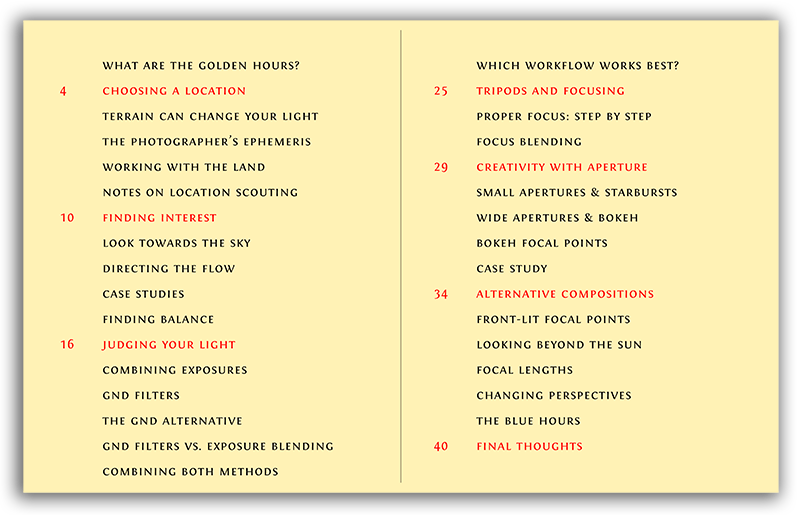 Alternative Compositions: To conclude, this section discusses how to take full advantage of the golden hours and explore different compositions that one would not normally consider, inspiring you to think beyond the mainstream confines and tap into your creativity. I explain the entire process of photographing the golden hours – from choosing a location and camera techniques, to the post processing workflow in your digital darkroom. 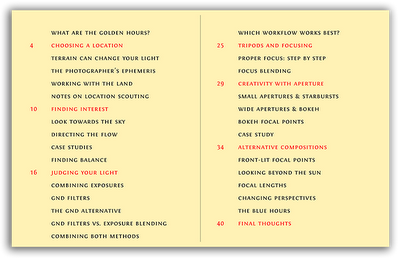 From start to finish, this comprehensive eBook will guide you step-by-step by detailing the workflow I use to capture the golden hours. 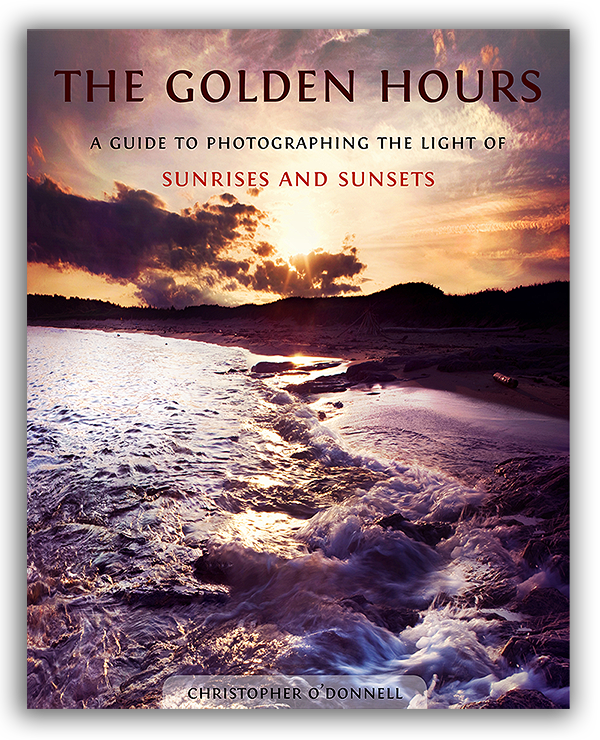 The Golden Hours is more than a guide for sunrises and sunsets; I also discuss other subjects and how to use the golden hour light to illuminate them under a different view – from grand vistas to small focal points.